I’ve just launched even more new needlepoint kits on my website, so why not take a look? Last week, I put up the ‘Alice’ range of kits (nine altogether) in the blue/peach colourway, and this week the minty green/beige colourway has been put up. 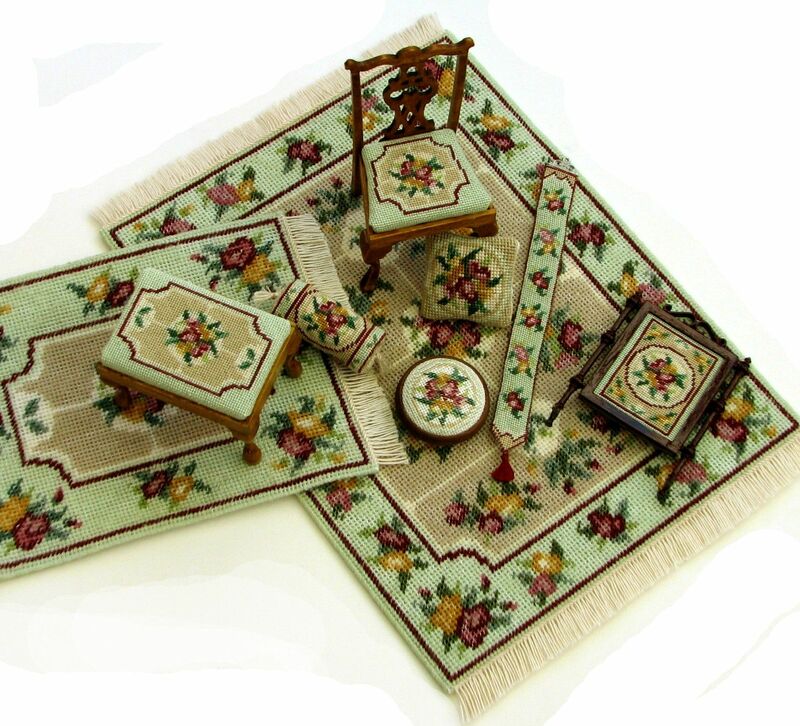 There are nine items in each set, and they are based on a Victorian floral motif. The design is called ‘Alice’, after a friend of mine who lives in Edinburgh. The design is available in all these different types of kit: two sizes of carpet, cushion, round footstool, rectangular stool, dining chair, firescreen, bellpull and bolster cushion. To make it easier to see which items match with each other, there is now a ‘Co-ordinating Kits’ page, which shows all the items together from each design family, here . The carpets are to be stitched on 18 count interlock canvas with Appleton’s crewel wool (chart packs are also available, if you’d prefer to make them in a different colourway or a different count of fabric). The cushion is to be stitched on 22 count canvas with two strands of Anchor stranded cotton. All the other kits are to be stitched on 32 count silk gauze, with one strand of Anchor. Prices start at £4.50 for the cushion kit, up to £21.50 for the large carpet kit. Shipping is free, worldwide, on any order of £10 or over. Under £10, a flat rate of £1.25 per order applies. In the September issue of Artisans in Miniature online magazine, there’s a feature about my website for doll’s house needlepoint kits, so why not take a look here? The article is called ‘New on the web’, not because my business is new – I’ve had the website since 1997 (one of the first miniaturist websites online, actually) – but because the website has recently had a complete overhaul. The magazine is great, and it’s FREE! 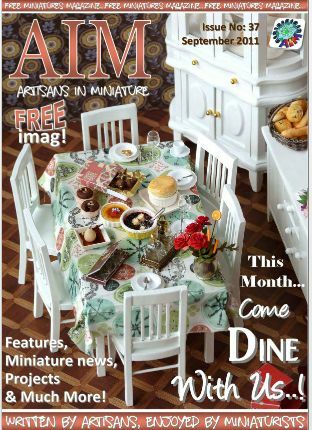 This month’s issue has the theme of food and dining rooms, so it’s mouth-wateringly tempting to look through – the food looks so real, you’d think you could really eat it!